t is the roof that has to take the brunt of nature's extremities during its entire life and hence utmost care must be taken in selection of the right roofing material. Wrong choice of roofing and cladding can create losses in terms of human lives and material in cases of natural disasters A good reliable roof with least number of complications gives peace of mind to meet these challenging needs of the customers, JSW offers superior quality Galvanised Corrugated sheets under the brand name "Jindal Vishwas"
Ensures maximum weight per sheet resulting in value for money. Conforms to IS 277 Assured quality. Uniform Zinc coating of 120 gsm Provides high corrosion protection and hence longevity. Uniform pitch and depth Lower overlapping resulting in lesser number of sheets required for roofing/ cladding. Higher corrugation depth Better water drainage and greater strength. Appropriate hardness Superior strength of the sheets, also preventing hair line cracks on the periphery of bolts. Wide product range Wide choice for minimum overlaps, resulting in minimum seepage points and savings in fixing accessories and thus enabling better planning. Glossy finish with uniform spangles Aesthetic appeal. Salt Spray and humidity quality tests Suitable for use under all weather conditions. Super safe staggered packing Specially designed three layered packing with staggered stacking of sheets for complete protection. Also permits easy counting of sheets. Jindal Vishwas GC sheets are an ideal choice for roofing & cladding applications because of their superior strength and longer life. They conform to IS 277 specification and undergo stringent salt spray & humidity quality tests to ensure their performance in all weather conditions. 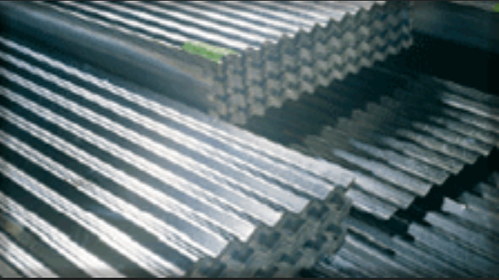 The higher corrugation depth and appropriate hardness coupled with higher corrosion resistance from its uniform zinc coating of 120 gsm makes it suitable for decades of usage in challenging environmental conditions. The light weight – high strength combination of Jindal Vishwas GC sheets makes them economical, as it requires lighter supporting structure & reduces transportation costs. They also ensure maximum protection to the occupants against the fury of nature. During monsoon, they do not absorb moisture & gain weight, unlike other roofing material where the deed load increases due to moisture absorption. It is quick, easy & convenient to install Jindal Vishwas GC sheets due to their low weight & zero breakages.